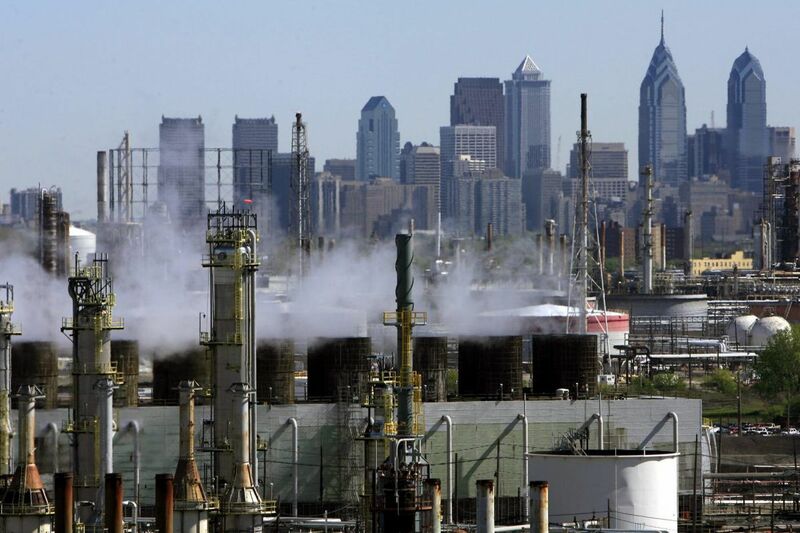 The Philadelphia Energy Solutions refinery in South Philadelphia, which has blamed its financial woes on the cost of complying with the federal ethanol mandate. For the second time this week, President Trump summoned advocates to the White House to try to resolve an acrimonious dispute that pits two Trump allies — Pennsylvania and Texas oil refiners and Iowa corn growers — over federal ethanol mandates. During an hour-long meeting Thursday afternoon with refiners, ethanol producers, fuel retailers, senators, and administration officials, Trump suggested imposing a cap on the soaring price of biofuel credits, which some refiners say have become an onerous cost. Philadelphia Energy Solutions, which operates the East Coast's largest refinery in South Philadelphia, blamed the costs of the ethanol mandate as the principal cause of its bankruptcy filing in January. PES said the cost of renewable fuel credits known as RINs have become its second-highest production cost, after crude oil. While the president suggested capping the price of the fuel credits, which would provide the refiners with relief, he also recommended relaxing rules to allow blending of 15 percent ethanol into fuel all year, which would increase the demand for ethanol. Trump called the Thursday mediation session after meeting on Tuesday with elected representatives and administration officials to try to settle the dispute. The high level of involvement from the White House suggests the importance of resolving a critical issue for two core political constituencies. The president offered to host another session next week after ethanol producers said they were unhappy with the proposed solution. Representatives of the refinery sector said they were pleased with Trump's push. "It gives us time to get out of this jam we're in," said Ryan O'Callaghan, a Philadelphia labor leader who attended the meeting. O'Callaghan said that Trump expressed concern about the welfare of refinery workers as well as grain farmers. "The president has brokered deals all his life," said O'Callaghan, who heads the Steelworkers local at PES. U.S. Sen. Ted Cruz (R., Texas), center, shakes hands with Monroe Energy President and CEO Jeff Warmann at a recent rally in Philadelphia supporting refinery workers. Cruz and Warmann attended a meeting Thursday with President Trump to try to resolve a dispute over the federal ethanol mandate, which refiners say harms their business. Four Republican senators attended both meetings with Trump this week, including Pat Toomey of Pennsylvania and Ted Cruz of Texas, who have argued that the current policy threatens refiners. Sens. Chuck Grassley and Joni Ernst, of Iowa, who have opposed proposals that weaken the federal ethanol mandate, also participated. Toomey and Cruz, in a joint statement, adopted the president's language and called the proposal a "win-win" solution for corn farmers and refinery workers. "We are making real progress, and, with the president's leadership, we believe we can and will ultimately solve the problem," Toomey and Cruz said. Several refiners attended Thursday's meeting, but not the management of bankrupt PES, which has become the target of sharp criticism from ethanol producers who say its own bad business practices led to its bankruptcy, not the biofuels mandate. "We had a productive conversation and the president indicated he is committed to continuing the discussion," PBF Energy CEO Thomas Nimbley said in a statement. PBF owns refineries in Paulsboro and in Delaware City, Del. Jeff Warmann, the chief executive of Monroe Energy, the Delta Air Lines subsidiary that operates the refinery in Trainer, also attended the meeting, along with Joseph W. Gorder, the chief executive of Valero Energy Co., a large Texas refiner and retailer.